An unofficial, on-going review of the best burger joints in the Twin Cities. 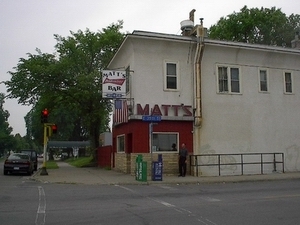 Matt's Bar - Home of the original Jucy Lucy, Matt's is a throwback not by intention but default. The un-updated interior complements the Spartan table setting (no plates provided). The Jucy Lucy is a cheeseburger lover's delight where molten cheese is sandwiched between two burger patties. First-timers are wise to heed the warning that the cheese needs to be allowed to cool - 'Fear the cheese' indeed. I suggest the fried onions and an order of fries. Now all can enjoy Matt's since it's smoke free. 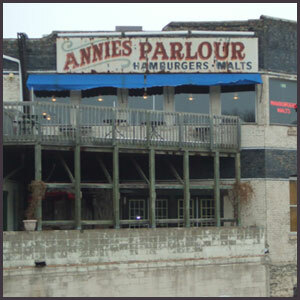 Annie's Parlour - Come for the burgers, come for the fries, come for the malts - heck, come for all three. Annie's Parlour is a comfortable, well-worn restaurant with a limited menu that seems to follow the philosophy to do a few things well. Keep in mind that the malts come with the mix can so they are best shared and a half order of fries is plenty for two. I prefer the caesar burger with smoked cheddar cheese and grilled onions. Try the outdoor patio if you happen to stop by on a comfortable weather day. L. Philip's Cafe (aka The Burger Place) - Well disguised among the myriad meal options in the Minneapolis skyway system is an entirely generic looking burger joint that just happens to make a great burger and fries (malts are also an option). It's hard to beat the combination of good flavor and class leading options made with certified Angus beef. I prefer the Southwestern burger, which comes loaded with jalapenos. Grab a few napkins - you'll need them for your nose if not your hands. Matty's - I have an affinity for restaurants that post the menu on the wall. It's a bonus when the menu is hand written on a chalkboard - old school. Menus are fine. How 'bout the grub? 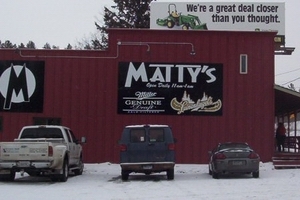 Matty's takes top honors for burger flavor. It's the kind of burger that perfectly fills the hankering for a hearty, simple meal after a full day on the lake. I'll be reordering the cheeseburger next time I'm in Brainerd, MN. Chili's - While Chili's lacks the character and individual personality of a sole proprietorship, it boasts a consistently great burger. The classic Oldtimer with cheese will often do in a pinch. Chili's has long held the position of top chain restaurant for me - granted, Outback Steakhouse is a close second. Feel free to contact me with suggestions - I'm always willing to try a new burger.